We are taking a break from our regularly scheduled programming to talk about beauty strategies you can use while on vacation. I was up in the Northwoods of Wisconsin with my family last week and while being on vacation is a lovely thing, NO ONE wants to sit around waiting for me to doll myself up when there is a lumberjack show to see. I am a notorious slow poke getting ready in the morning, so it is a challenge to get out the door quickly while looking somewhat together. Otherwise known as faking it until you make it. It takes me a loooong time to get any color so I usually have to cheat by using self tanner at the beginning of summer to not scare people off with my ghostly pallor. I had a bad experience with self tanner in high school but the formulations now so are much less streaky and orange than back in the day. THE KEY to successful self tanning is mucho exfoliating beforehand. You’re welcome. I was all prepared to extol the virtues of Bobbi Brown’s Sunless Tanner but unbeknownst to me they phased it out this year. So I am on the hunt for a new sunless tanner. Ping me if you know of any that you can use on your face AND body. I don’t usually wear mascara to the beach but if I know I’m on vacation or spending a lot of time on the beach I will get my eyelashes tinted. One application usually lasts up to a month and takes about 20 minutes at a salon for $20 plus tip. Benefit offers this service as do many other salons. You could also take it one step further and darken your eyebrows while you are at it. If you decide you want to wear mascara you still can, in fact your lashes will look even more amazing with a coat of mascara on top of the tinted eyelashes. Using eyelash curler will only take 30 seconds to curl your eyelashes and it will make you look more oh-so-much more awake. I actually recommend using an eyelash curler all the time, even if you are not wearing makeup that day. It will make a huge, huge difference in a very short amount of time. 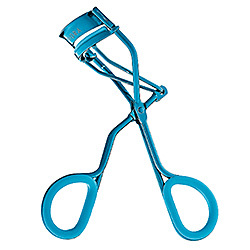 I own a Shu Umera Eyelash curler ($16) now but I liked my old Revlon ($2.99) one just as well. I recently received a tube of Stainiac Lip and Cheek Stain ($17) and thought this would be awesome for the beach. The color is subtle and long lasting and a solid addition to my summer bag of tricks. This gel formula with a wand is so much easier to apply than other tints I have tried and adds nice definition and color to your lips and cheeks without streaking. The sample I received for Beauty Queen gives a pink flush, but I would also like to try Homecoming Queen which is more of a bronzy/peachy flush. 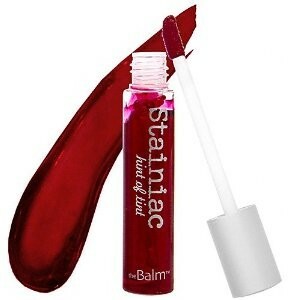 As a lipstain this product needs some chapstick or lipgloss with SPF layered over it. I have a layered bob with highlights and my hair gets super curly in the heat and humidity so the headband is to keep my hair out of my face if I decide my hair wet and/or if it’s windy. Sun and Chlorinated water are hell on your highlights, so if I feel like I need to do some damage control asap I will keep the conditioning spray handy and pretend like I’m deep conditioning my hair. 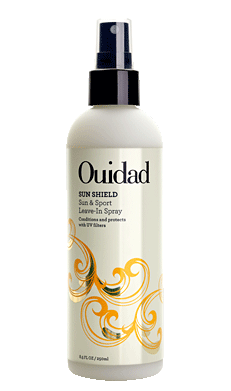 Something like Ouidad’s Sun Shield ($20) would be ideal. What beauty strategies do you use when going on vacation? Since we moved to Norway my hair freaks out all the time. It is crazy humid in the summer and it seems no amount of blow drying it straight or product will preserve it. So I wear it back a lot in a tight low ponytail. Boo. Do you have any good recommendations for letting hair curl in the humidity without going straight-out crazy after it’s already dry? 1) I’m sorry, I feel your pain we have the same type of weather here in Chicago. I could write a book about curly/frizzy hair. I promise to do a series of posts on the topic soon. 2) The short answer to your question is get to a Keratin treatment stat. Sure they cost money but everyone I know who has gotten one has never looked back. You could get a treatment just to help you through the summer. I haven’t gotten one yet but I really, really want to. 3) You say they don’t have Keratin treatments in Norway? Try the Living Proof products (available at Sephora). I have had good luck with them. We don’t have Sephora here but I was smart enough to have bought a bottle of Kerastase when we were in Seattle in June. Maybe that will help. Thanks for the tips, chica! « Keys to my Kingdom Part 3 – Secret Weapons!